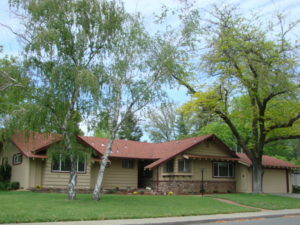 Centrally located near Neal Dow School and the Butte County Library, this 4 bedroom, 2 bath home is spacious and classic! Over 2300 s.f., including a finished basement that can be used as a shop, music room, study or even a 5th bedroom. The kitchen has a sunny corner sink, wall oven and TWO cooktops (one electric, one gas) with copper hoods. In addition to the family/dining area, there is a separate living room looking out to the back yard. Notice the built-in china hutch in the dining room and the built-in drawers in the master bedroom. Lot is over 1/4 acre, and the yard features a sparkling, inground pool and plenty of patio space for entertaining. There is even an actual gas lamp near the front walkway. Don’t miss this great home!